Meet Our New Conference Chair! Brittany Robart is an accredited Music Therapist working with clients in Vancouver, Surrey, and Abbotsford. Brittany received her bachelor’s degree from the Music Therapy program at Capilano University in June of 2018. 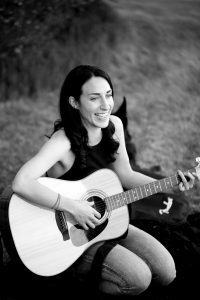 She currently works as a contract Music Therapist at BC Women’s Hospital in addictions and mental health, as well as for Creative Music Therapy Solutions where she works with seniors, children with autism and developmental delay, adults with brain trauma, and young adults with mental health challenges. Brittany has also had clinical experience on the Burn, Trauma, High Acuity, and ICU Unit at Vancouver General Hospital as an intern under supervision of Gemma Isaac, MA, RCC, MTA, developing a scientific, research based approach to supporting patients in medical care. Brittany is currently enrolled in the advanced training for theBonny Method Guided Imagery & Music with the Association for Music & Imagery. Brittany’s work as a Music Therapist comes from a deep place of empathy, compassion, and patience. She incorporates analytic, process-based Music Therapy techniques into her work, as well as a humanistic, holistic approach that focuses on supporting clients and patients in connecting emotional, mental, physical, and spiritual aspects of the self into healing. Brittany strives to create an inclusive, safe, and supportive environment that fosters beauty and meaning for all who participate in her sessions. Brittany can be reached at conference@mtabc.com.